Look who is 3 months old!! Birch’s three month birthday was also sort of his one year birthday here on Earth because I am fairly certain he was conceived on January 29. Born and conceived on the 29th – how’s that for some more number fun for ya! Look at him sittin’ up all by himself! I swear he is a little genius who can already talk. Often when he needs me in the bouncy seat he says “Mama” (I am not joking!) and Thomas got him to repeat “I love you” a few times. He says “NA” a lot when he’s tired (aka “nap”). He’s sort of like a parrot who can mimic sounds! We know he’s not actually talking, but his little noises are so similar to real words sometimes. He’s doing a ton of cooing now, and his little laughs are the cutest ever! He is a very smiley little guy and greets new people with big grins. He smiles at me before and after naps. A few mornings ago I opened my eyes to find him looking at me through the mesh of the Halo Bassinet and he broke out in a big smile. Such a happy little guy! He is really into actually playing with his toys these days. He gets this determined look on his face and jangles the rings or whatever I have hanging on the bar for 15-20 minutes or so. 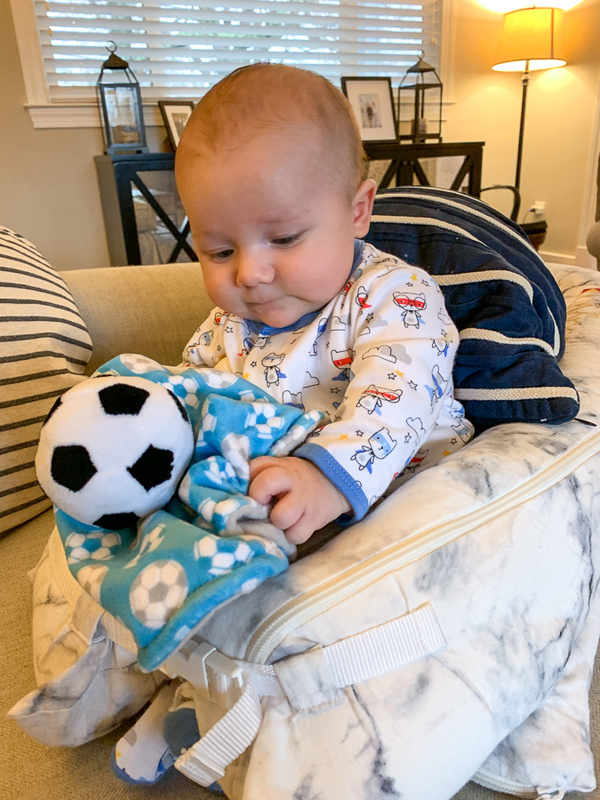 He also LOVES his soccer ball lovey and Gertie the Goose! Every single time I put Birch down to sleep and he actually falls asleep a miracle occurs. One of the things no one tells you about parenting is that getting a baby to fall asleep is hard. They don’t like to sleep! (Some do, but most don’t.) Mazen needed all kinds of help to fall asleep, so whenever Birch falls asleep unassisted, I am amazed. Sometimes he does need patting, a paci, or several pick ups to settle down, but most of the time I can put him down “drowsy but awake” as the experts say and he drifts off. I try to put him down for a nap between 90 minutes and 2 hours of awake time, as that’s usually when he starts to get fussy. Sometimes he smiles his way to sleep and sometimes he cries a little and wants some help, but overall he’s not too hard to get to nap. I am especially amazed that he goes back to sleep on his own at night. Every time he does I let out the breath I’ve been holding and go back to sleep myself. He’s actually been so sleepy at night sometimes I can’t even get him to nurse on the other side. Staying asleep is another story. Naps have been very hit or miss. He was miraculously doing 1.5-2 hour naps in the bassinet for a while and then suddenly those turned into 30-40 minutes. It’s been driving me a little nuts, but I knew we had it too good to be true. These short naps are what Mazen did his whole first 6 months, so I shouldn’t be so surprised they have returned. I’m wondering if I need to extend his awake time longer so he’s sleepier, but he’s fussy when I do that and seems to be tired at 2 hours, so I’m not sure! He’s been drooling like crazy, which several people have said is teething already. I find that hard to believe, however, his lower gums do seem to have a little white shape of teeth in there, so I think it’s possible he is getting those lower teeth sooner rather than later. Right at 12 weeks old, he went from being a wiggly little baby to a very strong infant and almost rolled over! I immediately started to unswaddle one arm, and that has gone surprisingly well. 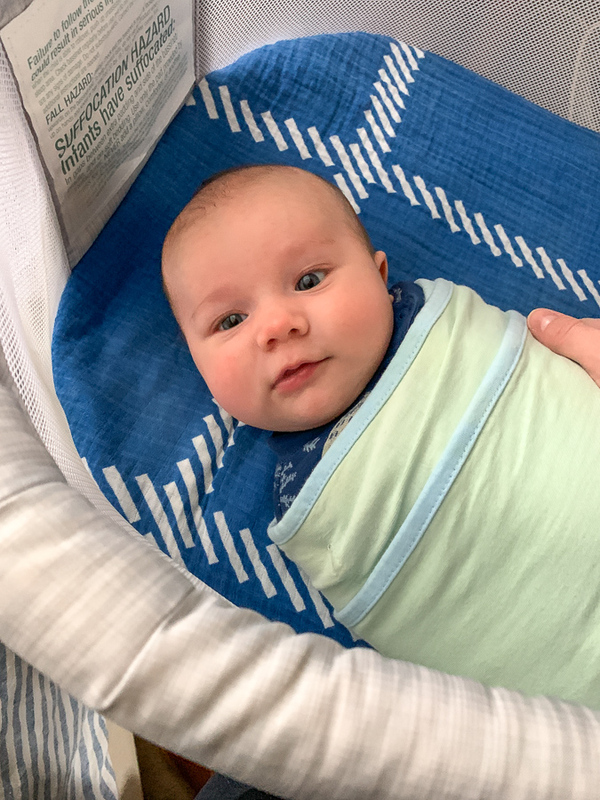 Not swaddling is so much easier, so I’m hoping we will transition out soon. B does love his hands though, so I hope they aren’t too much of a distraction. Breastfeeding is going well, and has gotten a lot easier than the early days. He’s reached the age when he can latch himself on, which is such a great contrast to those newborn days when you have to work so hard on the latch. He’s eating well about every 3 hours or so during the day. I think he’s still in the 50/60th percentile. I love watching him nurse, especially when he puts his hands on me and just nuzzles in. How do you know when to stop pumping extra? I’ve been doing the first-morning-nap pump for two months now and have a good stash in my freezer. Should I keep going?! I would be nice to stop and one less thing to do, but I do love having a little fresh milk in the fridge at all times. But I also have a decent freezer stash – more than I ever had with Mazen because I like my pump so much more this time around. Advice? It is with bittersweet emotion that I tell you that I won’t be cloth diapering this time around. I had planned to wait until about the 2 month mark to transition over, but every time I thought about the cloth diapers I was filled with a little bit of doubt: the laundry, the fact that we use two different changing stations, the eventual mess. I kept hesitating to start. And then I had a conversation with my friend Gwen about them and she was REALLY excited to cloth diaper. She asked me about my collection (Bum Genius Freetimes – they are the best) and if I would consider letting her borrow a few or sell them to her if I wasn’t going to use them yet. I thought the best thing I could do as a win-win was to gift her our whole collection, felt wipes, wet bags, liners and all. So I did. And she was more than thrilled. And that made me feel really happy and at peace with my decision. And that’s the end of that chapter. And finally – I found a babysitter! 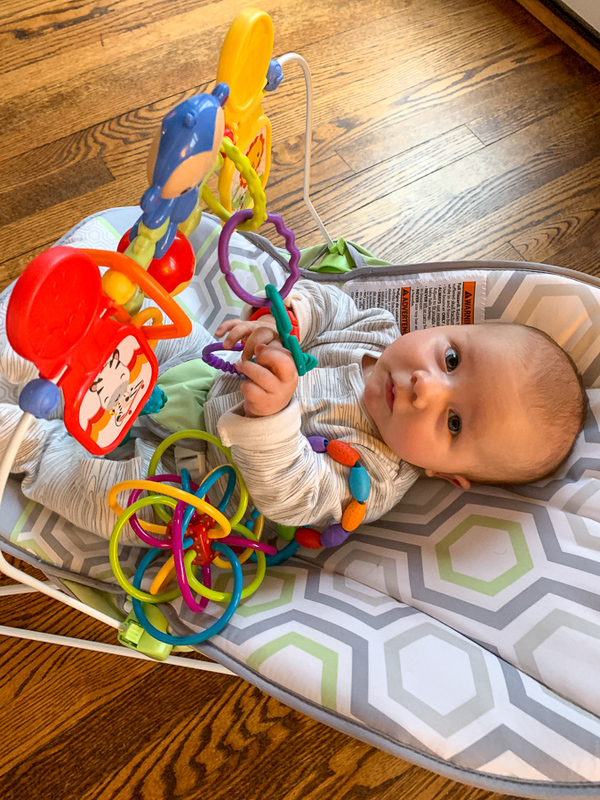 I knew I needed one just for a few blocks of uninterrupted work time each week, but the weeks when Birch took good naps I kept procrastinating putting an ad out there. A friend of mine passed on the names of two UVA grad students who then referred me to our sitter who had two mornings a week free. I’m so excited to have some scheduled work time (or errand time or appointment time or gym time or me time!) especially because naps have shortened so much in the past two weeks that I was getting interrupted every single time I sat down to work. And finally, I found these pics of me! Everyone says B looks like Mazen and Thomas, but I can see him in these a lot too – especially the top left where I look like a boy! My daughter was born on October 29, also! I love reading your updates and seeing that she is doing about the same as Birch! Literally, everything you wrote is what we are going through too, the shorter naps, drooling like crazyyyyy, the talking, etc.! It is so nice to read about another baby “in real time”. We just switched her to the Merlin sleep suit last night because she kept breaking her hands free in the swaddle, waking herself up. Knock on wood- she slept until 5 am after going to bed at 7:30, I fed her and she went back to sleep until 7:15. Anyways, I just wanted to say how much I appreciate you writing about Birch and your postpartum journey. Have a great day! First, Mazen is your twin! Second and I know you’ve mentioned it before but what pump do you use now? I have a Motif Duo and like it a lot. It’s SO portable! My old Medela was one of those giant tote bag ones and I hated it. My biggest regret was not pumping more when I had the chance early on. 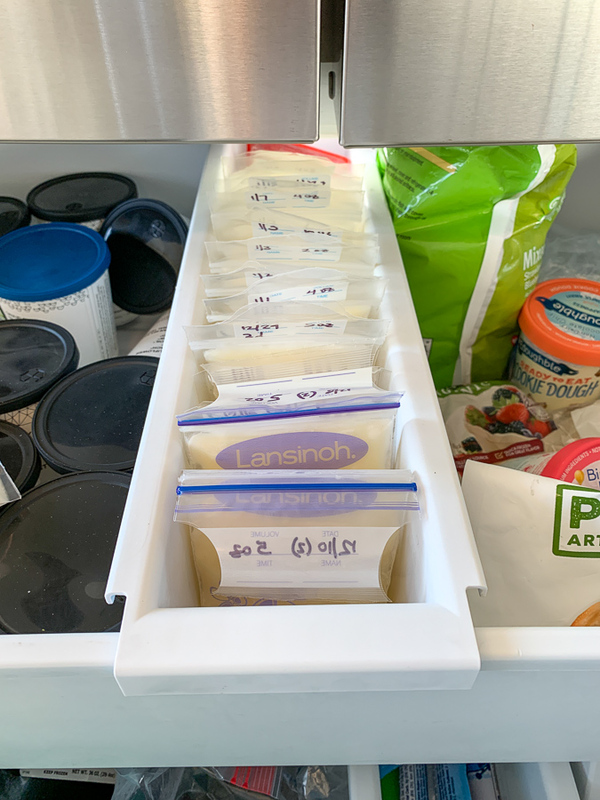 I think especially if you’re going to start incorporating a babysitter a few mornings a week, you’re going to want to keep that freezer stash up…Just my perspective. (You can donate the extra to a breastmilk bank, too, if you don’t end up using it.) Also, my daughter was the same – started teething at 2.5 months with insane amounts of drool, but the first teeth didn’t erupt until almost 6 months. It was a lot of drool, haha! Same with naps – always, always 30 minutes until she was about 6 months old and SOMETIMES started stringing 2 cycles together. 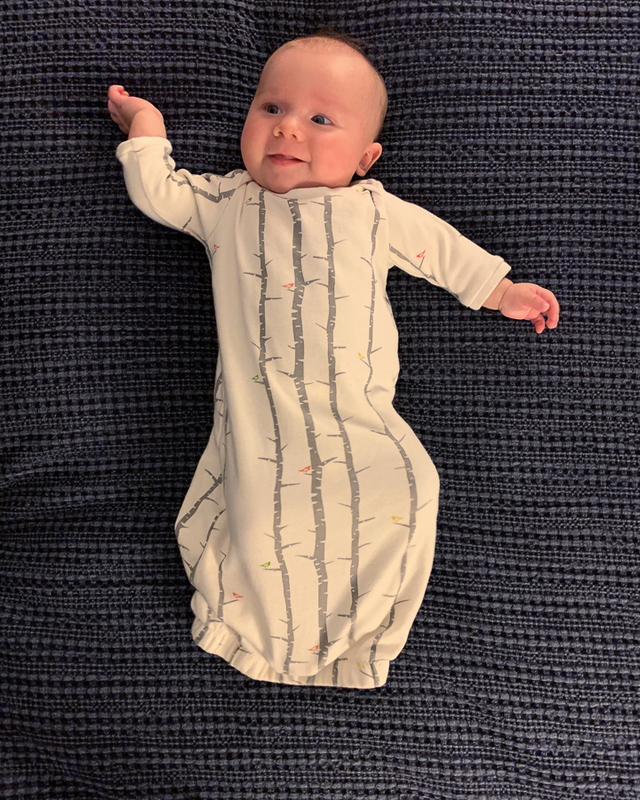 And I’m cracking up about your disbelief about Birch drifting off … mostly because I can barely believe it myself – my daughter was a lot like Mazen and I JUST CAN’T IMAGINE “drowsy but awake” EVER working!!! Hahhaha! Glad it is, though!!! Hahahha! I have to put him in there BEFORE he’s really tired for him to be happy to coo himself to sleep. It never worked with Mazen! Yes I supposed that I have nothing to lose to continue the pumping but time. I was going to comment that you could probably do a little math and see if you need to pump more, even for those times when you are away. And, since you are mostly with Birch, you could always pump a bit if you ran out. If your supply is stable and all is well with breastfeeding I would not pump! Because I’ll always be replacing the freezer stash with freshly pumped miss if I’m away from him for a feeding? So ideally, for any feeding you don’t breastfeed at, you would use pumped milk. I’d suggest grabbing the oldest first, but whatever works. And then when your stash gets lower you could pump in the mornings again. I work full time, pumped 3x per day and my kiddos never really wanted the bottles. So, I donated, which was awesome. BUT, if I was in your situation, I’d only pump as needed. So, use your stock piled supply and then reevaluate! Kelly mom has good resources, but typically a breastfed baby would eat about 3oz per feeding. So if you can estimate how much you have stored, you can sort of predict what your needs are. Perhaps you’re already doing this, but getting a pumping bra might make it seem a lot less onerous. It made a huge difference to me to be hands-free and pump both sides at once. I ordered one from Amazon; I can’t remember which one now, but I never bothered with the straps, just unclipped my nursing bra and zipped the pumping bra right over. I agree with others that pumping only gets harder; I wish I’d done more at the beginning while there is so much milk. I did end up with some extra that I was glad to be able to donate. Do you guys follow a nighttime routine? We’re just settling into one with or seven week old and would love any tips you have! We do a bath every other night, and our routine is really simple just bath, jammies, nurse, swaddle, white noise, in bassinet. So nothing fancy! We’ll add a book in there when he’s a little older too. Birch is SUCH a cute baby! 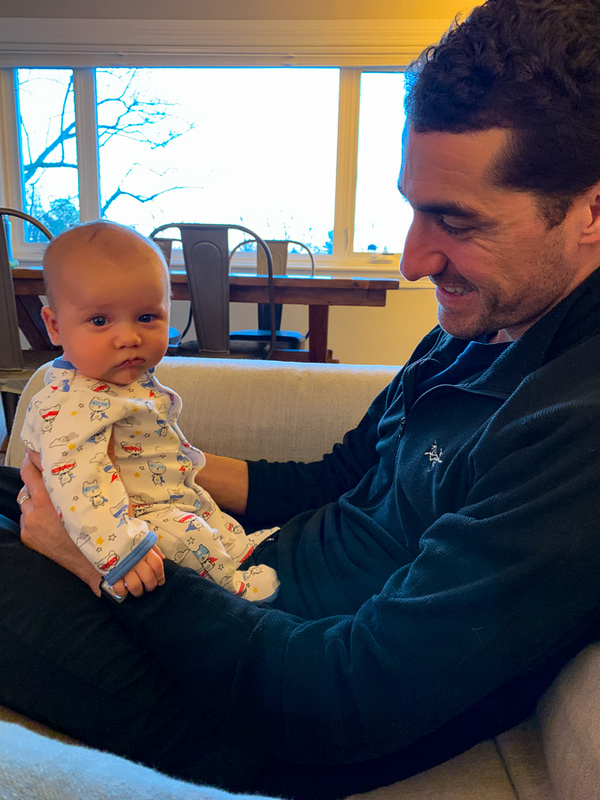 All babies are cute, but he’s in the 100th percentile cute (this is a very official ranking). I also see a lot of Thomas in him, but it looks like he’s got the Younger eyes with you and Mazen. Oh my goodness…been a reader for a while, so I remember baby Mazen. He was your TWIN as a baby (and still is)! It’s wild! I have a 1 year old and I remember the 4th trimester WELL. I went into parenting thinking I would try cloth diapering, but very quickly decided it wasn’t for me. I try to feed my baby organic when possible, still breastfeeding, etc, but cloth diapering is one thing I couldn’t get on board with. It seems too time consuming. How great that you were able to gift your supplies to someone who will really appreciate them. I’m sure you’ve mentioned it here somewhere, but what pump are you using? I use the Medela Pump In Style and I HATE pumping. Looking for good recommendations if baby #2 comes along some day. I have a Motif Duo and love how portable it is. I hated my Medela! Both of your boys are so darn cute! Here’s an idea…why not put Chapstick on Mazen before he goes to bed? Does he not like it? What about a yummy flavored one? He refuses to let me put it on! Have you seen the emoji chapsticks? I bet if you got him one of those (especially the poop one) he’d do it himself. Haha! true! he would love the poop. he has a darth vadar one i must find! That bottom left photo of you at the end looks just like Mazen! I’m not sure who I think Birch looks like, but he sure is adorable! And even if he isn’t technically talking yet, I consider that to be pretty incredible that he is mimicking your words. Future Einstein over there!! Birch looks exactly like you as a baby!! Especially in that bottom right picture! Birch is adorable! Acting like a little tree! (first photo). You can tell he is so loved, and has a lot of love to give. Where did you get that storage container for your freezer? It’s just part of my freezer. We have a sliding divider thing. That Birch is so. dang. CUTE! Like my goodness! I think he favors you in that pj pic at the top of this post. Keep pumping! Because of my job as a firefighter, I pretty much exclusively pumped with my kids. At a point when I thought I had a huge freezer supply (8 months old for my first child), I stopped pumping. I thought I had enough milk to last until the one year mark. What I didn’t factor in was as she grew, she would consume more milk. She also consumed more when she was sick and wanted nothing to do with solids. I felt really bad when I ran out at the ten month mark. If you are planning to breastfeed until the one year mark (or more), I would definitely keep up the extra pumping. It’s annoying, but totally worth it. Birch is so, so cute!! As for the pumping, I would just keep pumping once a day and then rotating out an old bag of milk and give him one bottle a day to keep him used to it. I know pumping isn’t fun, but having that milk stash is awesome and if you ever end up needing to be gone more than you plan for, it’s nice to know it’s there. With my daughter, we ended up giving her a bottle of frozen milk every night before bed and then I pumped and froze that milk. It was nice to give my husband some bonding time with her, we knew how much milk she was drinking before bed, and I could usually pump more than she drank which added to my freezer stash. But I know that’s a lot of work and isn’t for everyone! Thanks for the reminder to be using up the frozen milk. I haven’t actually touched it in 3 months and I probably should be using a FIFO method! I think you’re actually supposed to use fresh milk. Frozen milk is there to act as backup. I read it on kellymom or my baby411 book (sleep deprived brain) freezing and thawing compromise the milk nutrionionally. 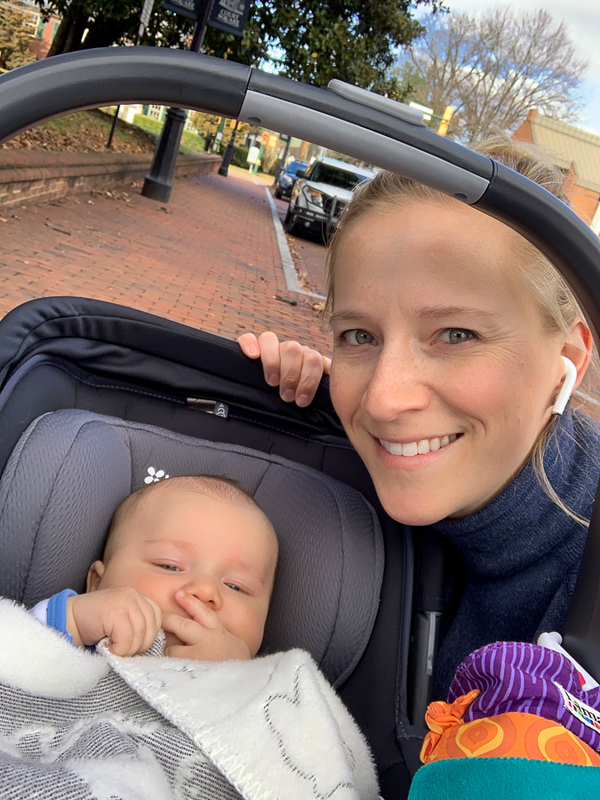 My son is a few weeks older than Birch and I try to pump twice a day – once before I go to bed and once after his first morning feed. This works well to get me a bottle for him at night (I like to ensure he’s getting enough before bed) and to freeze some milk every other day or so. Regarding short naps and sleep, do you follow takingcarababies on instagram? She has some e-courses, but also really helpful posts for all of that! I do follow her and she is great! Maybe Mazen would like to make the natural lipbalms you made a few years ago. When kids “cook” they tend to like the results. I am STILL using those!! But yes, he might, esp if he got to choose the flavor. Birch looks a lot like you and Mazen (and a bit like Thomas, too)!! Thanks for sharing your baby pics!! I am sure you will get tons of advice here … my 2 cents … not sure if you would consider this but if you have extra milk, there are always moms looking for it on humanmilk4humanbabies on facebook. We adopted and I would’ve loved pumped milk, but couldn’t find enough to last us, so I wasn’t able to go that route. Takingcarababies on instagram has TONS of a amazing sleep tips. They are my go-to. I have a 6 month old. 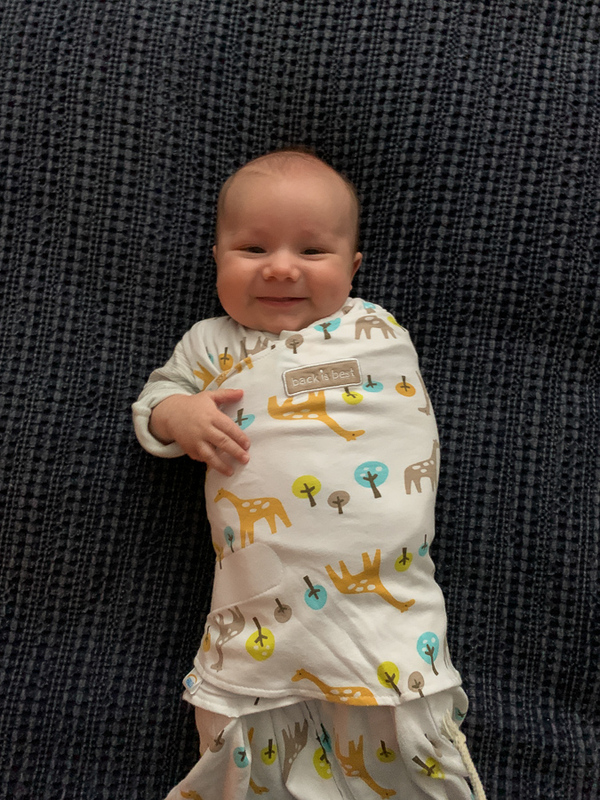 Also, I was nervous about not swaddling, but my guys LOVES his hands and once I gave him 2 arms free, he self-soothed immediately and sleep trained himself. Such a fun post to read! My daughter was born November 10. While pregnant I attended a breastfeeding class at a hospital in RVA, taught by a lactation consultant with tons of experience (her previous job was for a breast milk bank that’s the largest in the country.) She said that when it comes to using donated milk, the age of the baby really matters. If the donor mom has an 8 month old, then the baby who uses that milk should be around 8 months as well. Apparently the milk changes for the needs of the baby as he or she grows! This is my long winded way of saying that you should definitely use some frozen mill and not wait and give 10 month old Birch the milk your body made for 2 month old Birch. 🙂 I’m sure it’s not the end of the world, just not ideal! I heard the same thing and my lactation meeting but then she ended up saying it wasn’t that big of a deal to give the baby any age of milk. But that is really cool how the body can change based on the babies needs! So so so cute!! What a sweetie. Thanks for sharing these pics. 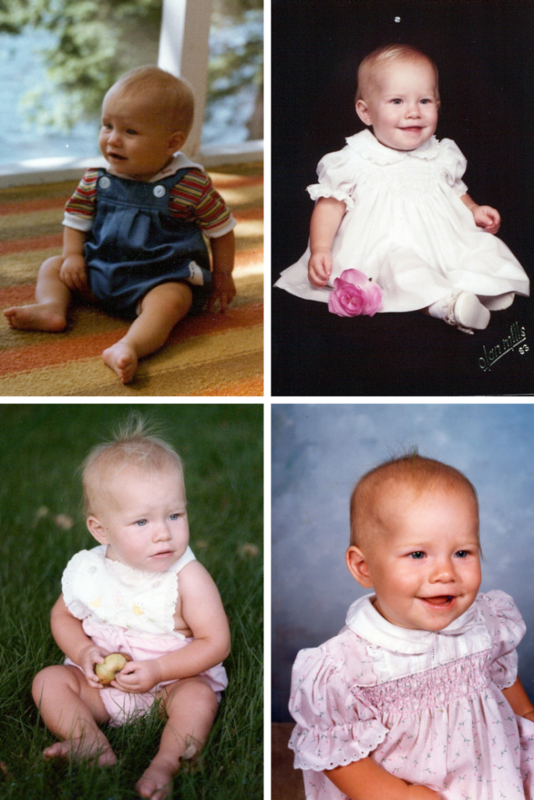 And OMG your baby pics – bottom left is straight UP Mazen! Wow! Great job pumping and freezing! It’s a lot of work. No advice on when to stop pumping, do whatever makes you feel comfortable. Some folks like a big stash, some feel just fine with a modest one. I see it in the comments above, but whatever you do don’t forget to rotate your stash a bit. Current guidelines are milk is good for 3-6 months in the freezer. And sure, as a previous commenter mentioned, fresh milk is best, but there’s nothing wrong with frozen when you need it. Still excellent baby food! Donate your breast milk to other mothers in need for their preemie babies!